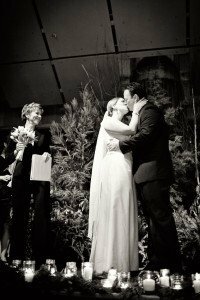 The “Kiss” – Tell Your Officiant to Get Outta The Photo! Okay, I admit it. I like to watch crazy wedding shows on television – they are like “eye candy” to me! And here is what makes me crazy: the Officiant or Minister pronounces a couple as “husband and wife” and doesn’t MOVE. It’s important that at the end of your wedding ceremony as you are enjoying your intimate moment, that your Officiant or Minister moves totally out of the moment AND out of the photo. As you can see here from Brian and Maggie’s wedding ceremony and “kiss,” I was “outta there” so they could enjoy the moment without close eyeballs totally on them. Photographer Kat Speyer, got a number of beautiful images from this moment at Islandwood on Bainbridge Island and several of the photos are intimate and exquisite. Bottom-line: By moving the Officiant or Minister out of the center line of this lifetime photo opportunity, a photographer has a clean and intimate shot of just the couple. Comments Off on The “Kiss” – Tell Your Officiant to Get Outta The Photo!